Matt Palmer has been teaching all levels of guitar for over 15 years. His students have been top prize winners in numerous guitar competitions, and have gone on to earn performance degrees at major universities throughout the United States. A dedicated and knowledgeable instructor, Matt has taught private instruction and classroom guitar at The University of Arizona, Washington College, Appalachian State University, Caldwell Community College, and numerous privately owned institutions. In demand as a performer and teacher, he has taught master classes at many guitar festivals and universities throughout the United States. Matt holds the Doctor of Musical Arts degree from The University of Arizona, as well as Master of Music and Bachelor of Music degrees in guitar performance. Matt is now accepting students of all levels for private instruction. References are available upon request. Matt’s studio is in Bowie, MD - centrally located between Annapolis, Baltimore, and Washington, D.C. Please contact or use the form below for studio rates and information. All payments are made in advance through Paypal. Contact for scheduling and current pricing. "Effortless Technique .... an Introduction to A-M-I Scales"
Matt's clinic is designed to introduce his technique of performing A-M-I scales. In a group setting, attendees will have the opportunity to learn about Matt's ideas about A-M-I scale technique, including but not limited to basic fundamentals of performing A-M-I scales, left and right-hand principles, ascending and descending scales, changing direction within a scale, shifting using A-M-I, special problems, and practical application. Attendees will be able to watch Matt demonstrate the techniques firsthand. All material discussed is available in Matt's method book on the subject. 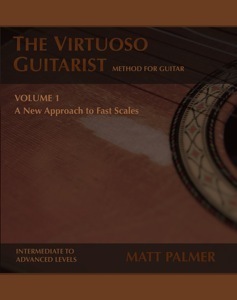 The goal of the technique is to provide guitarists with an alternate method of performing scales rapidly, fluidly, and efficiently. Attendees are encouraged to bring their instruments, but it is not necessary. Estimated duration of the workshop is 1 - 1.5 hours. Please contact for rates and availability. Please fill out the form below to inquire about lessons with Matt Palmer.